QANDIL MOUNTAINS, Iraq, Nov 6 2015 (IPS) - You can find those popular Turkish chocolate and orange biscuits, and there are also shovels for the coming winter snow. There’s also no shortage of those popular watches boasting the face of Abdullah Ocalan, the imprisoned leader of the Kurdistan Workers Party (PKK). From his small shop in the village of Zergely, Iraq, Rinaz Rojelat sells virtually everything the local villagers cannot grow in these rugged mountains. But these are hard times, Rojelat claims. The banner on display outside his shop pays memory to the eight neighbours he lost to a Turkish air raid last August. The rubble of their houses, just a 100 metres away, is also an eloquent reminder of the tragic episode. “The explosion woke me at dawn. In the first attack they killed one woman, and the rest after a second strike, just when many of us were trying to rescue the wounded from the debris,” recalls the villager, who still stares in disbelief at the scene in front of his business. 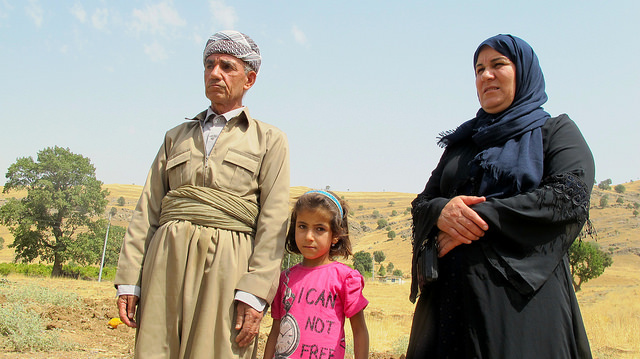 Unlike Rojelat, many have chosen to leave behind this village of 200 and find shelter down to the valley, some as far as Erbil, the administrative capital of Iraq´s Kurdish autonomous region, at 320 km north of Baghdad. Mohamed Sabah found an alternative option: he grows his crops and feeds his animals in Zergely during the day, and he spends the night with his relatives in neighbouring Bagirke, a 10 minutes´ drive further north. “After the attack I thought about leaving and never coming back, but how could I possibly make a living in Erbil? I am a peasant, my lands and animals are here,” the 28-year old Kurd explains from an orchard full of pickles, just by the rubble nearby. Sabah says that three of his relatives got injured last August, and that he had already lost a brother to a similar attack back in 1997. In fact, air raids in these mountains have been a common occurance since way before the last spike of tension between Ankara and the Kurds. However, the attacks have intensified since last July, when the peace process between both sides collapsed after a bombing in the Kurdish town of Suruç which killed 32 pro-Kurdish activists, a majority of them Turks. Since then, hundreds have died in the fighting, a majority of them non-combatants. The spiral of violence reached its peak on 10 October, when two suicide bombers blew themselves up at a peace rally in Ankara in which has been considered the largest attack in Turkey’s modern history. At about 10 kilometres further south from Zergely, the village of Bokriskan hosts the only hospital in this area. It is a modest building built by the PKK after the previous one, in neighbouring Leuzha village, was bombed by Turkey in 2008. Bokriskan´s medical centre is run by Media, a German nurse who decided to move to this part of the world more than 20 years back. It may be just a hospital but the locals in Bokriskan are well aware that its mere presence may pave way to further attacks. Maryam Hussein was sleeping in her house a few meters from the hospital when the bombs hit Zergely. That was the last time she saw her husband. After the explosion, Abdul Kadir Abu Baker did not hesitate to drive to the nearby village to help the wounded. He died in the second attack. Today, his widow says she has not set foot in Bokriskan nor Zergely ever since. “After the bombing I moved to my parents´ house in Nawchelekan, but I’m still scared because shelling can happen anytime, and there´s nowhere to hide,” Maryam Hussein tells IPS. Standing beside her, Dalyan, her brother, nods. Would their fate, and that of the whole community, had been a different one without the presence of the PKK in the area? Since the escalation of hostilities last July, Turkey claims to have killed of over 2,000 PKK fighters. Sauas Amed, a PKK senior official, put the number of casualties among their ranks at “something around 40.” “We have faced these kind of attacks for many years so we know how to protect ourselves,” Amed told IPS from an undisclosed location in the Qandil mountains. The huge gap between the death tolls given by both sides make it impossible to agree on a realistic figure. On a telephone conversation with IPS, Arez Abdullah, a MP for the Patriotic Union of Kurdistan in the Iraqi Parliament underlined the impotence felt by Iraqis over these and other Turkish moves in their territory. 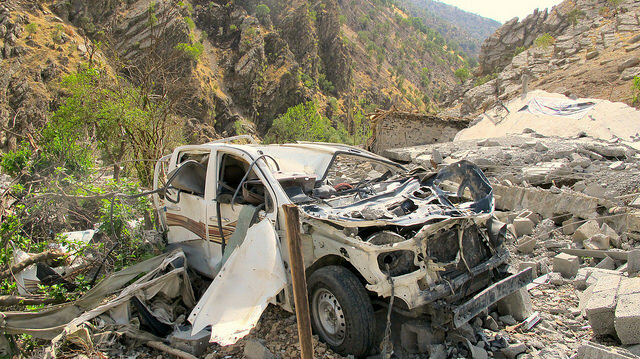 Air raids over the Qandil mountains have intensified over the last days, following the victory of the Justice and Development Party-AKP in the Turkish elections that took place on November 1. “It´s not just about the shelling in the mountains. We also have to cope with the loss of cities like Mosul in the hands of ISIS,” added Abdullah. The Iraqi MP admitted that the political and economical situation in Iraq make it impossible to give Ankara a strong response. 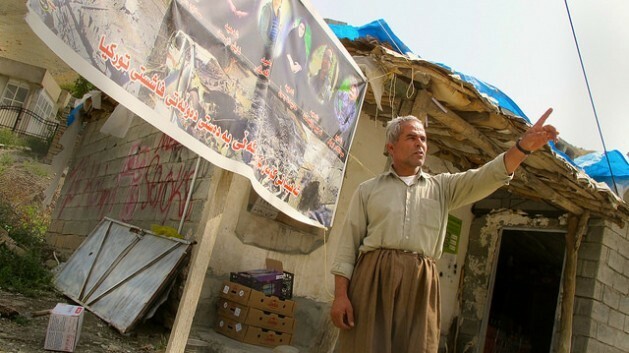 Meanwhile, Zergely´s single shopkeeper claims he has no fear of bombings, and that he will not leave “even if no customer shows up.” This trader has doubtless known better days, like that Newroz celebrations back in 2013, when Kurds from all over gathered in their thousands ahead the ceasefire declaration. “None of us had much hope in that peace process but we definitely didn´t expect this two years later,” lamented the trader, just before pulling down the shutter of his stall.